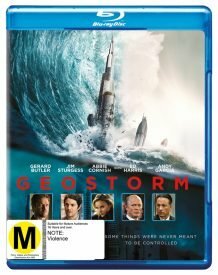 The disastrous disaster movie Geostorm is the week’s biggest new release on Blu-ray. It has a 2.40:1 aspect ratio and a “largely strong image“, DVD Movie Guide said. While most of the movie presented nice clarity, some wider shots looked a bit tentative. Still, the majority of the flick appeared solid, and no signs of moiré effects or jaggies occurred. The movie also lacked edge halos or print flaws. Blacks showed strong depth, and shadows were good, with nice opacity and clarity. “Much of the film is adorned by a sepia toned aesthetic that combines with the use of browns, beiges, and crimson to set the mood intended by the filmmakers,” AVSForum said. It rarely makes for eye catching imagery but the results are pleasing. Flesh tones tend to look a little balmy and fall in line with the film’s visual elements. Contrast is spot on and blacks are fairly delineated and deep. Images are crisp and resolute with defining sharpness that provides appreciable dimension. The video is whistle clean and shows no obvious signs of compression errors or video related anomalies. WhySoBlu understood why Warner Bros forewent the 4K UHD format for Geostorm but not its 7.1 audio omission. I get not wanting to put any extra money in a big bomb like this. However, you’re telling me in 2017 this ultra-weather disaster movie was packing nothing more than a 5.1 mix? If there was a genre of movie that was built to relish in the Atmos of DTS:X formats, its the disaster film. What we get here is a 5.1 track that winds up getting the job done, being solid and not much else. The week’s only other notable release is It on 4K-UHD, which comes a month after its Blu-ray bow. 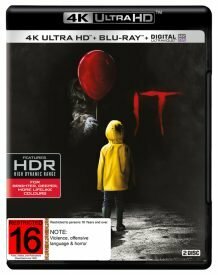 Forbes said it delivers a “very pronounced upgrade” over the HD Blu-ray, especially if you’re able to enjoy its Dolby Vision transfer. The bad news is that it’s not quite a reference-grade title. The main problem is that it’s not as consistently sharp as the very best looking 4K releases. There’s a general slight softness to the image, exacerbated on occasion by some of the anamorphic lens focus ‘vignetting’ that 4K grading can expose so ruthlessly. The Washington Times was disappointed the 2160p transfer was culled from a 2K master format. However, the high dynamic range tweaks make up for it. The dark scenes in the sewers and mansion areas that would normally appear muddy now look very sharp, and it’s easy to see all of the action. Also, vivid colour moments seen in a nearly florescent green river, a sink spewing a geyser of blood, the clown’s flaming orange hair, cracking white makeup on its forehead and razor-sharp teeth bathed in drool were certainly memorable. Also new are re-issues of The Punisher: War Zone, Orca: The Killer Whale, The Dilemma, Chaplin, The Borrowers and Bruce Lee: Deluxe Collectors Edition.